Design of experiments (DOE) is an off-line quality assurance technique used to achieve best performance of products and processes. This book covers the basic ideas, terminology, and the application of techniques necessary to conduct a study using DOE. 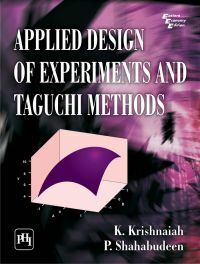 The text is divided into two parts--Part I (Design of Experiments) and Part II (Taguchi Methods). Part I (Chapters 1-8) begins with a discussion on basics of statistics and fundamentals of experimental designs, and then, it moves on to describe randomized design, Latin square design, Graeco-Latin square design. In addition, it also deals with statistical model for a two-factor and three-factor experiments and analyses 2k factorial, 2k-m fractional factorial design and methodology of surface design. Part II (Chapters 9-16) discusses Taguchi quality loss function, orthogonal design, objective functions in robust design. Besides, the book explains the application of orthogonal arrays, data analysis using response graph method/analysis of variance, methods for multi-level factor designs, factor analysis and genetic algorithm. Includes six case studies of DOE in the context of different industry sector. Provides essential DOE techniques for process improvement. Introduces simple graphical methods for reducing time taken to design and develop products. K. KRISHNAIAH (PhD) is Professor of Eminence, Department of Industrial Engineering, Anna University, Chennai. Earlier, he was Professor and Head in the department of industrial engineering, Anna University, Chennai. He received his BE (Mechanical) and ME (Industrial Engineering) from S.V. University, Tirupati (AP). Dr. Krishnaiah has thirty-four years of teaching and research experience and has published several papers in national and international journals. He is also the co-author of the book Applied Design of Experiments and Taguchi Methods (published by PHI Learning). His areas of interest include operations management, quality and design of experiments. |P. SHAHABUDEEN (PhD) is Professor and Head, Department of Industrial Engineering, Anna University, Chennai. He received his BE (Mechanical) from Madurai University and ME from Anna University, Chennai. Dr. Shahabudeen has published/presented more than thirty papers in international journals/conferences. His areas of interests include discrete system simulation, meta heuristics, object oriented programming and operation research.